Hi friends! 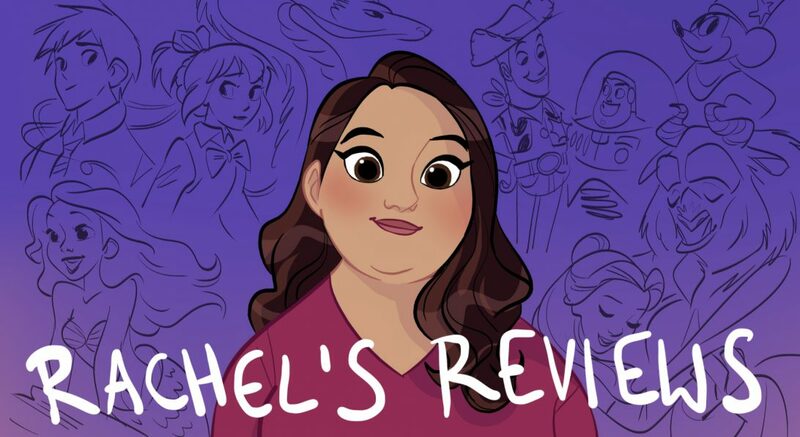 Welcome to Rachel’s Reviews. This little old blog started in 2014 when I tore my MCL and decided to review all 54 of the Disney Animated Canon films at the time. This was both a fulfillment of a dream and a way to keep my mind off of my pain. Since then I have gone from hobbyist reviewer to pursuing a career as a critic. I am available for hire to review any film or provide any editorial piece and am happy to work on SEO or brand building projects. When I was a little girl my sister and I would fill up the boring hours of the day creating our own little newspapers. These would include all parts of a newspaper: current events, comics, weather reports, and of course movie reviews. The movie reviews were naturally my favorite. Ready to report for duty! Growing up my parents weren’t big fans of any media. My Mother preferred books and my father was working 90 hour weeks and wanted to be outdoors whenever he could get away from supporting our family. However, what my parents were and are great at is encouraging an atmosphere of questioning, analysis and critique. My Mother especially hated the idea of consuming entertainment mindlessly. This is why we weren’t allowed to watch something like Saved By the Bell. It’s not that my Mother was opposed to it morally. She just thought it was stupid and did nothing to stimulate our growing intellects. I can think of so many times where my Mother would challenge me about a film or television show I enjoyed (we didn’t have TV for most of my childhood so it was predominantly movies). We would then have a discussion about the themes, filming choices and anything else that impressed me. It wasn’t until I went to college that I realized this type of analysis was unusual and often unwanted by my peers who just wanted to enjoy the entertainment without critical analysis (I learned to keep my mouth shut). Once I got to high school I joined the paper and wrote movie and television reviews among other articles. I remember my teacher, a very religious man, chastising me for not capitalizing the ‘He’ when referring to Jesus or God (I think in a review of The Prince of Egypt). I don’t even know if it is a true grammatical rule but I’ve always done it since then. I don’t want to make Mr Christensen upset! This whole time I always loved reading and watching criticism. Where other people dreamed of becoming an actor or sports star my pipe dream was to become a critic. It may seem hard to believe in this day and age of toxic fandom but I loved reading long winded defenses of something I disliked or frustrated essays on the flaws of a particular property I enjoyed. They wouldn’t normally change my opinion but I always found the experience enlightening. It probably goes without saying that the Siskel and Ebert program was a huge influence on my life (and after the show, Ebert’s blogging and writing). The way they challenged each other was captivating and even if I had no plans of seeing the films they were debating, I found the experience of them talking incredible. And there were others like Leonard Maltin’s books reviewing feature films and TV movies (the movie bibles of their day). Gene Shalit with his crazy mustache on the Today Show was always fun to listen to. Pauline Kael I discovered as an adult. I would give just about anything to write about film the way she did. I’m not sure why but despite my interest I never really considered film criticism or journalism as a realistic career choice. (Some critics would probably say this was a wise decision on my part). I didn’t decide against it in favor of something more practical. I literally never even considered it as a plausible option. I just kept going to movies and sharing my opinions with friends and family. With this realization I started attending the movies more often and would occasionally post reviews on this blog such as reviews of Frozen and The Lego Movie. In 2013 I got my dream job working in marketing and then in 2014 I tore the MCL in my knee making me bedridden for months. This was devastating at the time because I was very active in the local open water swimming community. Honestly I was probably the fittest I’ve ever been so I could probably work in more of that back into my life but times and seasons for everything! Anyway, I decided to make the best of a bad situation and fulfill a lifelong dream of watching/reviewing the entire Disney Canon. That’s why my film blog is called 54disneyreviews. At the time there were 54 films leading up to Big Hero 6 and that was going to be the end of my movie blogging but it turns out I really enjoyed writing about film! The more I wrote the more I was reminded of those old days of talking movies with my Mom and writing for the school paper. My next step was to start my youtube channel and it was unprofessional and simple but I loved sharing my opinion. One early memorable post was my rant on how much I hated the finale of How I Met Your Mother (it wasn’t pretty. There were tears). In 2016 I got my first taste at interviewing when Morgan Stradling asked me to interview the creators of a film called Snowtime at the Sundance Film Festival (first time at Sundance) for rotoscopers.com. Since then I have written many articles for rotoscopers and interviewed countless people including Nick Park, the creator of Wallace and Gromit. Over the years my blog and channel kind of morphed into the podcast with Rachel’s Reviews starting in 2015 and Hallmarkies in 2017. Now the podcasts consume nearly all of my free time, and I’m glad they do. I have made so many friends from around the globe, and I love talking to them about film/television. I love the preparation of a podcast (even if the editing afterwards isn’t my favorite). I love crafting an argument and trying to defend it as best as I can. I know twitter can be a mess, but I really do love it (probably to an unhealthy degree)! I LOVE live tweeting programs and it all goes back to that experience talking movies with my Mother in our kitchen or listening to Siskel and Ebertquarrel. Then out of the blue I get added as a critic on rottentomatoes and I find myself for the first time thinking- could I actually do this for a living? Could I make this work? It’s been pretty overwhelming to be honest, but I’m doing my best to take advantage of every opportunity that has come my way. Recently I was doing a podcast with my friend Tom on the show Star Trek Discovery. It was an episode I didn’t really care for because I find the klingons to be off-putting and kind of gross. With a little reticence on my part, we sat down to discuss it and by the end of the episode my opinion had changed. Well, not really my opinion, because I still didn’t love the episode, but I felt enlightened by the discussion of why I didn’t like it instead of just experiencing frustration. This is why I love criticism! It can take something I don’t like and through the analysis of said property make it enlightening! This is what true criticism and not just nitpicking or trolling does! This is why it is exciting and wonderful! I once heard someone decry film critics as a ridiculous profession where “people are paid to state their opinion”. This is perhaps because the dichotomy of rotten tomatoes (as much as I love them) has reduced their analysis to a good or bad score. That may be a helpful quick guide but it is not the job of a critic. A critic should get you thinking about what you like and why you like it, and that process should make you a better person. A good critic should inspire you to watch something you’d never watch on your own. He or she should wade through the huge amount of offerings and find the gems. They should explain what is special about a property so that you, the reader, can then find the words to explain what you find special. Hopefully the conversation keeps growing, and we all develop a passion for art and the experience of loving things (even if it is all loving different stuff!). I realize what I described is a bit of a pipe dream, but I’ve seen it happen in my own sphere of influence. Whether it is begging all my friends to watch Your Name or interviewing a cool writer they might not have noticed otherwise, it can be a wonderful, enriching experience. Regardless, I hope I am a positive influence for good, and can show my love of film and film criticism to all who will listen. It’s an honor and privilege and I’m so excited for whatever comes in my future! What about you? What do you gain from film, art, food or any other kind of criticism? Do you have any favorites? How do you think critical analysis helps you to enjoy the media we consume more? I would love to hear your insight. Sure love ya! Hi! I enjoyed reading your Disney reviews. I thought your posts are great and I will like to nominate your blog for the Liebster Award! Check out more details on my post (URL: https://chowkimwan.wordpress.com/2015/03/26/78-liebster-award/), and I hope you will respond to it soon! Hi I’ve nominated you for the Versatile Blogger Award. You don’t have to accept but have a look at the link if you’re interested. You caught me at a free moment. There’s something that I’d like to discuss with you. Can I email you? Thanks and lol no, it’s an offer that I have. Hi Rachel,I didn’t realize how lengthy this blog is,Maybe one day I will watch all 54!Ty for referring me over. Hello! (I couldn’t find any other way to contact you except for leaving this comment so I hope it reaches you)! This is Louisa with Screen Zealots. I’m in the process of putting together the Online Association of Female Film Critics. It’s going to be a small Association of women critics who exclusively write film reviews online. I’ve been reading your blog for a while and I’d like to extend an invitation for you to be a charter member! There are NO membership dues and this is and will always be entirely free. It will be great publicity for your site too! If this is something that you’re interested in, please contact me and let me know. I’m also looking for more female bloggers and online film critics to join us so please send along their information too. I do ask that all members place a logo on their website; it doesn’t have to be hugely prominent, just placed somewhere so we can get some traffic and you can get some recognition too. I also will need a short bio and photo of you to add to our Members page as well as the URL of your website. Best of all, we will even have our own end of year awards that we can publicize to studios and online. As the organization grows, I welcome ideas that you may have for content or for sharing your expertise with the rest of the community. I really want this to be a place where we can all support each other. Yay! I’ll be in touch. I’ll send it to you. You’ll be listed as a Charter Member! I also love Disney! I’m gonna review every Disney animated movie every day for 56 days. You’ve got my follow.